Sri Gayatri Mantrartha Dipika (Illuminations on the Essential Meaning of Gayatri) has been compiled for the pleasure of Sri Caitanya Mahaprabhu and the followers of His disciplic succession known as the Gaudiya Vaisnava sampradaya. This publication presents the remarkable madhurya (conjugal) conception of gayatri as revealed by sastra (scripture), sadhus (pure devotees), and acaryas (bona fide spiritual masters). When the contents of this book are examined by the serious readers, all will surely agree that the Gaudiya Vaisnava conception of gayatri is the summit of theistic thought. In the Gaudiya Vaisnava sampradaya, the gayatri which the guru (bona fide spiritual master) gives to the sadhaka (devotee) at the time of diksa (initiation) is that of the Vedic diksa (upanayana) and also that of the Vaisnava pancaratrika-diksa. The Vedic diksa (upanayana) is instituted by giving the brahma-gayatri. The Vaisnava pancaratrika-diksa is instituted by giving three pancaratrika-mantras (mula-mantras) and three pancaratrika-gayatris. The brahma-gayatri begins with om, the bija (seed syllable) followed by the maha-vyahrtis (bhuh bhuvah and svah), then follows the gayatri itself, tat savitur varenyam bhargo devasya dhimahi dhiyo yo nah pracodayat. The use of the word dhimahi (meditation or to invoke the form and activities of the Supreme Lord) is used in all gayatris. Similarly we find that there are four fundamental characteristics in all pancaratrika-mantras and gayatris: the use of such bijas as aim or klim at the beginning, namatmaka or the presence of nama (the holy name) as the central pivot of the mantra, the words svaha or namah indicating pranama (offering obeisances), and the word dhimahi indicating dhyana (meditation). Krsna, the Supreme Personality of Godhead Himself, spoke the Pancaratra literature. The Narada Pancaratra specifically deals with the topic of bhakti and therefore it is most important for all devotional aspirants in the Gaudiya Vaisnava sampradaya. Tapah, pundra, nama, mantra, and yaga; these five items comprise panca-samskara. They are the cause of intense devotion to Lord Hari. Tapah means performing austerities and professing one's self as a servant of Hari (Visnu/Krsna). Pundra means applying tilaka marks (vertical lines drawn on the body) symbolizing the body as the temple of Hari. Nama means receiving the holy name from the spiritual master and chanting that name according to his direction. Those who offenselessly chant nama are automatically imbued with all good qualities. One who chants the holy name of Hari (Visnu/Krsna) thus becomes qualified on the strength of the holy name to receive Vedic mantras, the fourth of the panca-samskara. Mantra means mantra-diksa or receiving the brahma-gayatri (upanayana) and the pancaratrika-mantras. After receiving the mantra-diksa the sadhaka is engaged in the worship of Sri Murti under sastric (scriptural) regulations and this is called yaga. These are the five processes for purification called panca-samskara. If one is interested in practicing the process of temple worship one must positively take shelter of a guru and learn the process from him. Having received the proper mantras from the guru one can worshipSri Murti. In Kali-yuga, the pancaratrika system is mostly recommended for those who want to perform yaga, the worship of Sri Murti. Either pure or impure, or having passed through all conditions of material life, if one can remember the lotus-eyed Krsna, he becomes extermally and internally clean. Sri Caitanya Mahaprabhu has taught five essential angas (practices) for the performance of suddha-bhakti (pure devotional service): Sri Murti seva (worship of the Lord in the temple), Sri Bhagavat-katha (hearing Srimad-Bhagavatam), Sri nama-sankirtana (congregational chanting of the holy name), Sri Krsna bhakto (association with pure devotees of Krsna), and Sri Mathura-mandala (living in the district of Mathura). In all these processes chanting of the holy name (sri namasankirtana) is the central point, that is, the bhagavata system. To assist in the purification of the sadhakas and to enable them to worship the Sri Murti in the temple, the followers of the bhagavata system also accept upanayana and the pancaratrika-diksa. Lastly it may be considered that both the upanayana and pancaratrika-diksa are but parts or secondary to the bhagavata system. Having received the holy name from the guru and having chanted the holy name properly for sometime the sadhaka is then offered mantra-diksa. The first gayatri given by the guru to the sadhaka at the time of mantra-diksa is the upanayana (om bhur bhuvah svah tat savitur varenyam bhargo devasya dhimahi dhiyo yo nah pracodayat om). This gayatri is the first in the category of Vedic gayatris and is known as brahma-gayatri. It is also commonly referred to by the sadhaka as brahma-vidya and veda-mata (the source of transcendental knowledge and the mother of the Veda). Indeed brahma-gayatri is the origional sound vibration upon which the Vedic literature is based. Within the Veda itself gayatri is first written in the Rig Veda (3.62.10) without the maha-vyahrtis as tat savitur varenyam bhargo devasya dhimahi dhiyo yo nah pracodayat. In the Sukla Yajur Veda (36.3) the gayatri is written with the maha-vyahrtis as bhur bhuva svah tat savitur varenyam bhargo devasya dhimahi dhiyo yo nah pracodayat. In the Candogya Upanisad (Chapter 4.17.1-3) we find the narration wherein Prajapati (Lord Brahma) meditated on the nature of the universe (visva). He thus realized that the three planes of material existance are prithivi (physical), antariksa (mental), and swarga (intellectual). These three planes are thus represented by the maha-vyahrtis bhuh, bhuvah, and svah. The seed of the Rig Veda is bhuh, the seed of the Yajur Veda is bhuvah, and the seed of the Sama Veda is svah. These three bijas (maha-vyahrtis) are said to have been derived from om as three primary colors are contained in a ray of white light. Similarly Prajapati came to the realization that as veins pervade all leaves so om pervades all vak (sound). Therefore the rsis (sages) have concluded that om (the seed) is to be uttered at the beginning and the end of brahma-gayatri. Om, when uttered at the beginning and end of brahma-gayatri, is the Vedic standard by which one should perform gayatri-japa (gayatri-repetition). When the personified form of brahma-gayatri is manifest she appears with five faces. These five faces correspond with the five principle features of the brahma-gayatri: 1) om (the seed), 2) the maha-vyahrtis (bhuh, bhuvah, svah), 3) tat savitur varenyam (indicating sambandha, relationship), 4) bhargo devasya dhimahi (indicating abhidheya, the process of surrender), and 5) dhiyo yo nah pracodayat (indicating prayojana, the consummation). The three pancaratrika-mantras given by the guru to the sadhaka are the guru-mantra (aim gurave namah), the gaura-mantra (klim gauraya namah), and the gopal-mantra (klim krsnaya govindaya gopijana-vallabhaya svaha). The three pancaratrika-gayatris given are the guru-gayatri (aim gurudevaya vidmahe krsnanandaya dhimahi tan no guruh pracodayat), the gaura-gayatri (klim caitanyaya vidmahe visvambharaya dhimahi tan no gaurah pracodayat), and the kama-gayatri (klim kamadevaya vidmahe puspabanaya dhimahi tan no anangah pracodayat). Although in the context of the Puranic setting the pancaratrika system was taught by Lord Visnu only after the demons Madhu and Kaitava had stolen the Vedic mantras from the mind of Brahma, we find in the authoritative book Sri Brahma Samhita that Lord Brahma, at the outset of creation, heard the gopal-mantra pronounced by Divya Saraswati (the divine vibration of the Supreme Personality of Godhead) even before receiving omkara (the Vedic gayatri of threefold form). Furthermore, it is the opinion of Sripad Jiva Goswami that upon receiving omkara, which had manifest from the divine flute of Sri Krsna, Lord Brahma also meditated on the kama-gayatri (klim kamadevaya vidmahe puspabanaya dhimahi tan no anangah pracodayat), which is the fifth note of the divine flute. Having thus received the status of dvija (twice born), Brahma entered into a state of blissful transcendence. Therefore it must be said that the pancaratrika system of receiving mantras and gayatris (such as gopal-mantra and kama-gayatri) is in no way inferior to that of the Vedic system at any time. Since both systems emanate from the Supreme, both may be taken as eternal. Having thus received the Vedic diksa and the Vaisnava pancaratrika-diksa, the sadhaka of the Gaudiya Vaisnava sampradaya wears the yajnopavita, the Brahmana thread consisting of nine strings symbolizing the status of his being a dvija (twice born). One who has received this dvija (second birth) can gain admittance into the transcendental world via contemplation and meditation on the gayatri. The nine threads of yajnopavita symbolize the nine practices of suddha-bhakti (pure devotional service): sravanam, kirtanam, smaranam, pada-sevanam, arcanam, vandanam, dasyam, sakhyam, and atmanivedanam (hearing the glories of the Lord, chanting the glories of the Lord, remembering the Lord, serving the lotus feet of the Lord, worshiping the Sri Murti of the Lord, offering prayers to the Lord, serving the Lord in all respects, becoming the friend of the Lord, and surrendering everything to the Lord respectively). Similiarly the yajnopavita symbolizes the nine islands of Sri Navadvipa Dhama: Antardvipa, Simantadvipa, Godrumadvipa, Madhyamdvipa, Koladvipa, tudvipa, Jahnudvipa, Modadrumadvipa, and Rudradvipa. These nine islands also correspond to the nine practices of suddha-bhakti. The yajnopavita also symbolizes the nine stages of developing suddha-bhakti namely sraddha (faith), sadhu-sanga (associating with saints), bhajana-kriya (practicing pure devotional service), anartha-nivrtti (purification of the heart), nistha (being fixed in the Absolute Truth), ruci (sweet taste), asakti (attachment to everything connected to Krsna), bhava (awakening of feelings of love for Krsna), and prema (intense feelings of love for Krsna). These nine stages also correspond to both the nine practices of suddha-bhakti and to the nine islands of Sri Navadvipa Dhama. In the gayatri we find three bija-mantras, om, aim, and klim. Om denotes sat, invoking the potency of eternality. Aim denotes cit, invoking the potency of knowledge, and klim denotes ananda, invoking the potency of bliss. In the Narada Pancaratra bija-mantras have been explained as primordial sound fragments which have the potency to evoke a particular energy both within and outside a person who utters the bija. This of course presupposes having received the bija from the guru ( bona fide spiritual master). As in the brahma-gayatri - each of the three pancaratrika-gayatris also have three stages of contemplation - sambandha, abhidheya, and prayojana (relationship, the process of surrender, and the consummation). By the use of the syllable vid as in vidmahe, meaning acknowledgement of the Lord, sambandha, the relationship between the Lord and the living entity as master and servant respectively, is established. By the use of the syllable dhi as in dhimahi, meaning worship of the Lord, abhidheya, the process of surrender by which one developes asakti (attachment), and bhava (feelings of intimacy with the Lord) is established. By the use of the word pracodayat meaning to impell one to spontaneously engage in loving devotional service to the Lord, prayojana, the consummation of prema (spontaneous divine love - raga-marg) is established. The first chapter of this book defines om as nondifferent from the worship of the personal aspects of the Absolute Truth, Sri Sri Radha Krsna. The second and third chapters describe the topmost meaning of the brahma-gayatri according to Srimad-Bhagavatam - the full fledged purport of theism, culminating in Radha-dasyam, the Divine Service of Srimati Radharani. 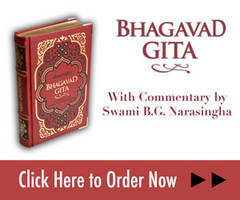 The fourth chapter examines the meaning of guru-mantra and guru-gayatri. The fifth chapter examines the gaura-mantra and the gaura-gayatri. Chapters six, seven, and eight describe the gopal-mantra, kama-bija, and kama-gayatri in relation to the divine sentiments of madhurya-rasa (conjugal love). Thus Sri Gayatri Mantrartha Dipika is completed in eight auspicious chapters. When studying the schools of Vaisnava thought in India, namely the sampradayas (disciplic successions) of Sri, Brahma, Char Kumar, and Rudra one finds that all these sampradayas chant the brahma-gayatri during the three sandhyas (morning, noon, and evening) of the day, whereas the chanting of the pancaratrika-mantras and gayatris are uttered optionally according to the particular instructions given by the respective guru. Each of the sampradayas has its own particular meditation on the brahma-gayatri in terms of its ultimate goal, or highest ideal. It is here that one can measure to which level in theistic thought a sampradaya has realized . It is the word savitur in particular upon which the sampradayas establish their philosophical conception of the brahma-gayatri. The question then arises as to who savitur refers. Savitur, according to the rules of Sanskrit grammar, can refer to brahman (effulgence), the sun, fire, our conscious nature as jiva souls and intelligence. Savitur is further identified as Saraswati, Agnidev, Surya, Surya Narayana, Paramatma (the Supersoul), etc. Thus the brahma-gayatri is explained as meditation on the sun or the Sun God by some, and as meditation on the Paramatma, Visnu, Krsna and so forth by others. The followers of Sankaracarya's school of advaita-vedanta are also among those who chant the brahma-gayatri, their conception being that savitur means brahman, their ultimate goal being to merge their individual identity therein. However, this conception does not find sufficient support in the Vedic system of knowledge.The concept of brahman (sayujya-mukti) as the subject of brahma-gayatri finds support only in the false interpretations and arguments of the followers of Sankaracarya, not in the Vedic pramana (evidence). "A person desiring material gain or liberation in the next life can achieve either by chanting gayatri; but the worshiper who is devoid of desires attains the Supreme Abode of Visnu." In his book Tantrasara Sri Madhvacharya summarizes the above information by describing that there are twenty four syllables in gayatri (ta, tsa, vi, tuh, va, re, ni, yam, bha, rgo, de, va, sya, dhi, ma, hi, dhi, yo, yo, nah, pra, cho, da, yat) and these are called varnas (positioned by divine arrangement). These twenty four varnas have corresponding governing forms of Visnu/Krsna; Kesava, Narayana, Madhava, Govinda, Visnu, Madhusudana, Trivikrama, Vamana, Sridhara, Hrsikesa, Padmanabha, Damodara, Sankarsana, Vasudeva, Pradyumna, Aniruddha, Purusottama, Adhoksaja, Narasimha, Acyuta, Janardana, Upendra, Hari, and Sri Krsna respectively. Similarly in the Rig-veda the words om asya janato nama cid-viviktan mahaste visnu indicate that om is the name of Visnu. Thus we find no real scope for impersonalist meditation within the brahma-gayatri. In his Tattva Sandarbha, Sripad Jiva Goswami has elaborately explained with references to various Puranas that the Srimad-Bhagavatam is the natural commentary on the brahma-gayatri and that brahma-gayatri is exclusively a meditation on the Supreme Personality of the Absolute Truth. He at no time gives credence to the impersonal conception of gayatri. That light is called the Supreme Brahman because the word bhargas (in brahma-gayatri) means effulgence. That effulgence is Visnu, who is the cause of the universal creation, maintenance, and dissolution. Some people say "effulgence" (bhargo) in brahma-gayatri refers instead to Siva, while others say it means sakti. Yet others say it refers to the sun, and still others say it refers to fire. While chanting brahma-gayatri, the brahmanas who perform Vedic fire sacrifices (Agni-hotras) worship various demigods. But it is Visnu who is present in the forms of Agni (fire) and other demigods, and the Vedas praise Him as the Absolute Truth, brahman." Although there may be differences of opinion between the various branches of scholars, philosophers, and religionists regarding the conception of the brahma-gayatri, there is a final conclusion which can be reached by the proper study of the Vedic literature, the standard by which philosophical controversy is resolved in India. It is said in India in this regard that "The Vedas advise like a king, the Puranas like a friend, and the Kavya like one's beloved, but the Srimad-Bhagavatam advises like all three." Thus it is understood that the Srimad-Bhagavatam is the ultimate pramana and therefore it should be taken as the final word in philosophical subject matters concerning the Absolute Truth. Vyasadeva's statement about Srimad-Bhagavatam should be taken as most authoritative. Vyasadeva, being the author of the Vedas, the Vedanta Sutra, and the Srimad-Bhagavatam, certainly knows in which of these scriptures the Supreme Essence of Truth can be found. It is Srimad-Bhagavatam which will help us to understand the purport of brahma-gayatri. Gayatri is the mother of the Vedas and the commentary of such is given in Srimad-Bhagavatam. Brahma-gayatri is the prototype of all Vedic mantras. Thus the brahma-gayatri is a concise statement as to the significance of all the Vedas. In the brahma-gayatri the word dhimahi, meaning let us meditate, is important. The appearance of this word in any particular verse or mantra has been taken to indicate brahma-gayatri. In Srimad-Bhagavatam the first sloka says: dhamna svena sada nirasta-kuhakam satyam param dhimahi. The brahma-gayatri also says dhimahi. Since the Srimad-Bhagavatam invokes the brahma-gayatri in its opening stanza by the use of the word dhimahi, this signifies that the entire text is an explanation of brahma-gayatri. That the brahma-gayatri phrase indicated by the word dhimahi begins this Purana shows that this work has the nature of the brahma-vidya (Vedic knowledge of the Supreme) called brahma-gayatri. Because Srimad-Bhagavatam describes the purport of brahma-gayatri, the Srimad-Bhagavatam itself is called the fruit of the tree of Vedic knowledge, nigama-kalpa-taror galitam phalam. Indeed, Srimad-Bhagavatam is the fullfledged meaning of the brahma-gayatri. A similiar statement is found in Srimad-Bhagavatam wherein Sukadeva Goswami invoked the blessings of the Supreme Personality of Godhead. Then the gayatri of threefold form that is the form of omkara (om/a-u-m), mother of the Vedas, emanated as the beautiful harmonious sequence of the Song of the Divine Flute of Sri Krsna. Entering the ears of Brahma, that melodious sound was swiftly manifest within his mouth as the gayatri. Thus Brahma, who was born of the lotus flower, received gayatri as it emanated from the Divine Flute-Song of Sri Krsna, and so he was initiated by the Supreme Lord, the original guru, and elevated to the status of twice-born (dvija)." Unless you are initiated by a bona fide spiritual master in the disciplic succession, the mantra that you might have received is without any effect. It appeared to Brahma in the stage of his mature realization after meditation on the kama-gayatri, that he is the eternal maidservant of Krsna. Such realizations of Brahma and the pure cognition therein must surely be the highest ideal of achievement among the bona fide students who chant the sacred gayatri-mantras. Lord Brahma is the original guru in this universe. The direct disciple of Brahma was Narada Muni. Srila Vyasadeva (the compiler of the Veda) was the direct disciple of Narada, and Madhvacharya was the direct disciple of Vyasa. From the disciplic succession of Madhvacharya, Sri Chaitanya Mahaprabhu accepted Sri Iswara Puri as his spiritual master. Because Sri Caitanya accepted initiation in the Brahma Madhva sampradaya that sampradaya has become most glorious. From Him (Sri Chaitanya) the disciplic succession is known as the Gaudiya Vaisnava sampradaya and its teachings are being spread throughout the whole world. The eternal abode of the Supreme Lord is called Vaikuntha. The highest planet in that spiritual sky (Vaikuntha) is called Goloka, wherein the Supreme Lord Sri Krsna eternally enjoys His transcendental pastimes with His eternal associates. Among the eternal associates of the Lord the gopis are the most exhalted, and among the gopis Srimati Radharani is the best. It has been mentioned in the narration of the Skanda Purana that out of many thousands of gopis, 16,000 are prominent. Out of these, 108 are important, and out of 108, eight are principal. Out of eight gopis, Radharani and Candravali are chief, and out of these two Srimati Radharani is superior. Janma means manifestation, adyasya means adi or original, yatah means from whom. From whom has the original rasa (madhurya) manifested? Radha, who is itaratah distinct from all others, and Krsna (anvayat). Artesu means various pastimes and abhijnah means expert. They are expert in the performance of pastimes. Vyasa, the adi kavi says the sabda brahma entered his heart (hrda) and he understood through prema bhakti these pastimes (tene brahma hrda adi kavaye). When, under the order of Narada, Vyasa sat in meditation in a trance of prema bhakti (bhakti-yogena manasi samyak pranihite 'male) this is what he realized, and it is about this, the pastimes of Radha Krsna, that he wrote in Srimad-Bhagavatam. Vyasa says that these two, and Sri Radha in particular, are so wonderful. Who can understand them? Even Krsna is bewildered by Radharani, what then can Anantasesa and others know about Her (muhyanti yat surayah)? Land (mrt) turns into water and flows, while water (vari) takes on the character of land and becomes stunned upon hearing the flute of Sri Krsna, which He plays only to attract Sri Radha, whose effulgence (tejah) dims the light of the stars and moon, tejo vari mrdam yatha vinimayo. Among the gopis there are three kinds, those who favor Radha (headed by Lalita), those who serve in the opposition's side (headed by Candravali) and those who take sometimes the side of Radha and sometimes the side of Krsna (headed by Visakha). They are all wonderful, yet all three groups (yatra tri sargo) are insignificant (mrsa) in Her presence, yatra tri sargo 'mrsa. All have their purpose only in relation to Her. Radha's presence and influence (dhamna) defeats (nirasta) all interference (kuhakam) created by the opposition party such as that of Jatila and Kutila, and the leader of the gopi opposition Sri Candravali, dhamna svena sada nirasta-kuhakam. Thus their pastimes go on eternally (satyam). Therefore I meditate (dhimahi) upon these two (param) who are actually one in mahabhava, and one as potent and potency. Vyasa here has described Radha and Krsna in the singular, purposefully and appropriately, as well as neuter in gender because they are beyond the conceptions of male and female." Thus far we have established with sufficient references from guru, sastra, and sadhu that the Srimad-Bhagavatam is indeed the natural commentary on brahma-gayatri. That which we find in Srimad-Bhagavatam should be understood to be the essense of the brahma-gayatri. Everything is possible by the mercy of the Supreme Lord and His devotees. When one has acheived such grace one can understand the worship of Sri Sri Radha Krsna and that of Sri Caitanya to be the purport of gayatri. It is mentioned in the beginning of this introduction that the Gaudiya Vaisnava conception of Sri Gayatri is the summit of all theistic thought. As evidenced in the Vedic scriptures, this is by no means a stretch of the imagination. In fact in the history of the world a more complete conception of the sweetness of Divinity has never before been revealed. Such is the sum and substance of Sri Gayatri Mantrartha Dipika. We humbly pray that the Supreme Lord Sri Caitanya Mahaprabhu may be satisfied with our endeavor, and that all His dear most devotees will similiarly be pleased with this presentation.